A new Maurienne-Tarentaise shuttle which flies through the air like an eagle! A glide over 1300 m… 1 minute 45 seconds of pure pleasure in breathtaking surroundings, from the 3 Valleys peak at 3230 m, at the top of the Bouchet chairlift in the Orelle resort, over to the Val Thorens crest, at 3000 m, at the top of the Thorens Funitel. 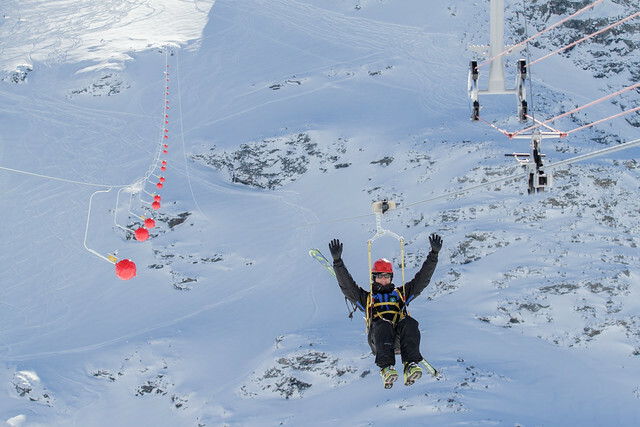 From Orelle to Val-Thorens, suspended from a steel cable, comfortably installed in a cocoon of fabric which will take you over the 100 km/h barrier, you can experience what it feels like to be a great bird of prey, soaring over infinite spaces. Access is reserved to skiers by the Bouchet chairlift, in the Orelle resort. The glide costs 55 €, and tickets are purchased on-site. The use of the Tyrolienne is subject to weather conditions.